"Six sticks of dynamite that blasted his way to freedom...and awoke America's conscience!" A few other prison films had already been released before this short, 90 minute film: the classic The Big House (1930) about brutish prison conditions, Howard Hawks' Criminal Code (1931), Ladies of the Big House (1931), and director Rowland Brown's Hell's Highway (1932) (the first of the hard-hitting chain-gang films - deliberately released by RKO's producer David Selznick a few months earlier). And many later men-in-chains films have paid homage to this one by borrowing various plot elements in different ways: Blackmail (1939) with Edward G. Robinson, Stanley Kramer's The Defiant Ones (1958) with Tony Curtis and Sidney Poitier as escapee prisoners chained together, and Cool Hand Luke (1967) with Paul Newman as a recalcitrant prisoner. Val Kilmer starred in a made-for-TV movie re-creation, The Man Who Broke 1,000 Chains (1987), about a man sentenced to work on a chain gang after WWII for a petty crime. The film earned three Academy Award nominations (with no wins): Best Picture (it lost to Cavalcade), Best Actor (Muni lost his second nomination to Charles Laughton for his performance in The Private Life of Henry VIII), and Best Sound. Eventually, reform of the chain gang system was successful. By 1937, chain gangs had been outlawed in Georgia. In the mid-40s, Georgia Governor Ellis Arnall proposed to be Burns' lawyer if he would return and settle the matter. Burns voluntarily and courageously returned to the state in 1945, where the Georgia Pardon and Parole Board commuted his sentence to time served and restored his civil rights. But he was not officially given a full pardon (because he had admitted being guilty for the holdup). 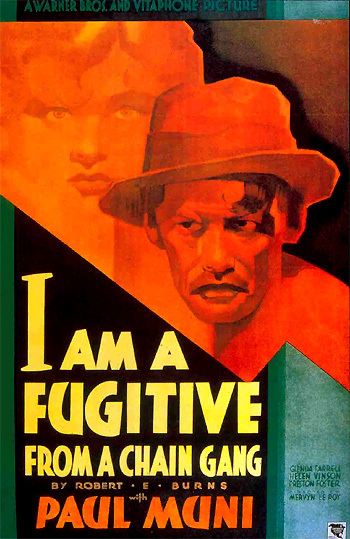 In the realistic film, to appease southern film exhibitors and the state of Georgia, there is no mention or hint of the state of Georgia (it was omitted from the title of the picture), but it's clear that the character is imprisoned in a southern state (with large numbers of blacks on the chain gang) and its penal system were being implicated. The film was actually banned in Georgia. After the credits, the film opens with snapshot portraits of each of the sixteen major cast members with their character names. A World War I veteran Sgt. James Allen (Paul Muni) is returning home from the war on a troop ship that docks in New York. The papers report their heroic arrival: "SUNSET DIVISION RETURNING HOME TODAY." The soldiers are pleased to be at the end of bunk inspections. For his future, Allen is planning on using his military's technical training to get "some kind of construction job...being in the Engineering Corps has been swell experience and I'm makin' the most of it." Ironically, one of the soldiers remarks: "Well, we'll be readin' about you in the newspapers, I'll bet." Allen doesn't plan to return to his "old grind" in a factory job. The Army changes a fellow. It kinda makes you think different. I don't want to be spending the rest of my life answering a factory whistle instead of a bugle call. I'll be cooped up in a shipping room all day. I want to do something worthwhile. Rev. : ...after a good night's sleep, you'll be ready to take up where you left off at the factory. A soldier of peace instead of a soldier of war. Jim: I don't want to be a soldier of anything. You see, Mom. I want to get out, away from routine. I had enough of that in the Army...I've been doing engineering work in the Army and that's the kind of work I want to do now. A man's job where he can accomplish things, where he can build, construct, create, do things. Rev. : That sounds very nice, but after all, a job in the hand's worth two in the bush. It's not the kind of work I want to do...It's too monotonous...No one seems to realize that I've changed, that I'm different now. I've been through hell. Folks here are concerned with my uniform, how I dance. I'm out of step with everybody. I was hoping to come home and start a new life - to be free, and again, I find myself under orders, a drab routine, cramped, mechanically even worse than the Army. And you, all of you, trying your darndest to map out my future, to harness me and lead me around to do what you think is best for me. Doesn't it occur to you that I've grown? That I've learned that life is more important than a medal on my chest or a stupid, insignificant job. His mother encourages him to follow his heart if that will make him happy: "He's got to be happy. He's got to find himself." A map charts Jim's train journey from the Mid-Atlantic states to New England (North of Boston) to find construction work. But after a short stint, he is laid off ("last in, first out"). So he crisscrosses the country to find steady work. He travels by steamer down the East Coast, across the Lower Gulf states and the Gulf of Mexico to New Orleans (where no jobs are available), and then by train North to Oshkosh (and Lake Winnebago) in Wisconsin. There, he drives a truck in a lumbering company - his "first job in four months." But the job is short-lived and he must again hit the road. Pete persuades the reluctant cook in the empty diner to toss two greasy hamburgers (covered with onions) on the grill. And then to Jim's surprise, Pete suddenly pulls a gun on the cook. At gunpoint, he also orders Allen to "get that dough out of the register. Go on, do as I say." The unwilling accomplice stuffs the $5 dollars from the till into his pocket, as Pete rips out the phone lines and shouts to the cook: "Don't start yellin' for the cops." But the police have already been alerted and kill the gunman. Allen panics and flees out the side door, and is implicated when caught with the cash, although he pleads with them: "I didn't do nothin'." He is an innocent man, but unfortunately in court, he is dealt a harsh punishment from the Judge (Berton Churchill): "I see no reason for leniency since the money was found on your person. Futhermore, upon detection, you attempted to escape which would, of necessity, increase the seriousness of your offense." In accordance with the laws of the state (unidentified), Allen is sentenced to prison at hard labor for ten years for the $5 robbery. The pounding of the judge's gavel transitions to the clanging sound of a blacksmith's hammer placing shackles on his ankles. Wearing the horizontally-striped uniform of a prisoner on a chain gang, he is assigned to hard labor in County Camp No. 2 - a primitive, forbidding labor camp with armed guards and a stockade.